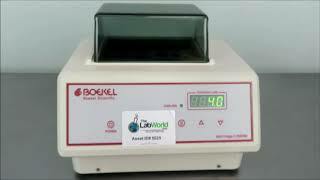 The Boekel MiniFridge II Cooling Dry Bath provides a compact and convenient means to incubate and store samples that’s a great alternative to ice buckets. The dry cold of this refrigerated block holds samples at ambient down to 18°C below ambient, typically 4°C, with a fluctuation of less than +/-1.0°C perfect for maintaining the 14°C used in ligation reactions or the 17°C used to store oocytes. This compact block cooler holds two standard dry blocks, or can be used with flasks and beakers acting as a refrigerated water bath. This Boekel MiniFridge II Cooling Dry Bath comes with sample block holder and has been fully tested by our service team. Instrument is excellent condition and ships out within 1-3 business days from receipt of order.